LingvoSoft FlashCards English <-> Spanish for Windows is part of LingvoSoft Suite - the complete language solution available only from LingvoSoft. 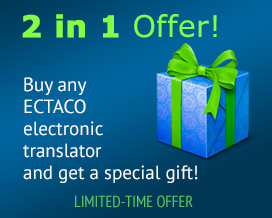 Now it easier than ever to learn new words, increase confidence and speak like a real native in no time at all. The intelligent way to make learning another language fun, LingvoSoft FlashCards are the number one choice of millions of satisfied language learners around the world! 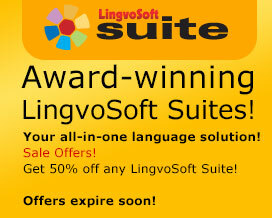 LingvoSoft FlashCards English <-> Russian for Windows is part of LingvoSoft Suite - the complete language solution available only from LingvoSoft. Now it easier than ever to learn new words, increase confidence and speak like a real native in no time at all. The intelligent way to make learning another language fun, LingvoSoft FlashCards are the number one choice of millions of satisfied language learners around the world! LingvoSoft FlashCards English <-> German for Windows is part of LingvoSoft Suite - the complete language solution available only from LingvoSoft. Now it easier than ever to learn new words, increase confidence and speak like a real native in no time at all. The intelligent way to make learning another language fun, LingvoSoft FlashCards are the number one choice of millions of satisfied language learners around the world! LingvoSoft FlashCards English <-> French for Windows is part of LingvoSoft Suite - the complete language solution available only from LingvoSoft. Now it easier than ever to learn new words, increase confidence and speak like a real native in no time at all. The intelligent way to make learning another language fun, LingvoSoft FlashCards are the number one choice of millions of satisfied language learners around the world! LingvoSoft FlashCards English <-> Dutch for Windows is part of LingvoSoft Suite - the complete language solution available only from LingvoSoft. Now it easier than ever to learn new words, increase confidence and speak like a real native in no time at all. The intelligent way to make learning another language fun, LingvoSoft FlashCards are the number one choice of millions of satisfied language learners around the world! LingvoSoft FlashCards English <-> Polish for Windows is part of LingvoSoft Suite - the complete language solution available only from LingvoSoft. Now it easier than ever to learn new words, increase confidence and speak like a real native in no time at all. The intelligent way to make learning another language fun, LingvoSoft FlashCards are the number one choice of millions of satisfied language learners around the world! LingvoSoft FlashCards English <-> Italian for Windows is part of LingvoSoft Suite - the complete language solution available only from LingvoSoft. Now it easier than ever to learn new words, increase confidence and speak like a real native in no time at all. The intelligent way to make learning another language fun, LingvoSoft FlashCards are the number one choice of millions of satisfied language learners around the world! LingvoSoft FlashCards English <-> Greek for Windows is part of LingvoSoft Suite - the complete language solution available only from LingvoSoft. Now it easier than ever to learn new words, increase confidence and speak like a real native in no time at all. The intelligent way to make learning another language fun, LingvoSoft FlashCards are the number one choice of millions of satisfied language learners around the world! LingvoSoft FlashCards English <-> Turkish for Windows is part of LingvoSoft Suite - the complete language solution available only from LingvoSoft. Now it easier than ever to learn new words, increase confidence and speak like a real native in no time at all. The intelligent way to make learning another language fun, LingvoSoft FlashCards are the number one choice of millions of satisfied language learners around the world!